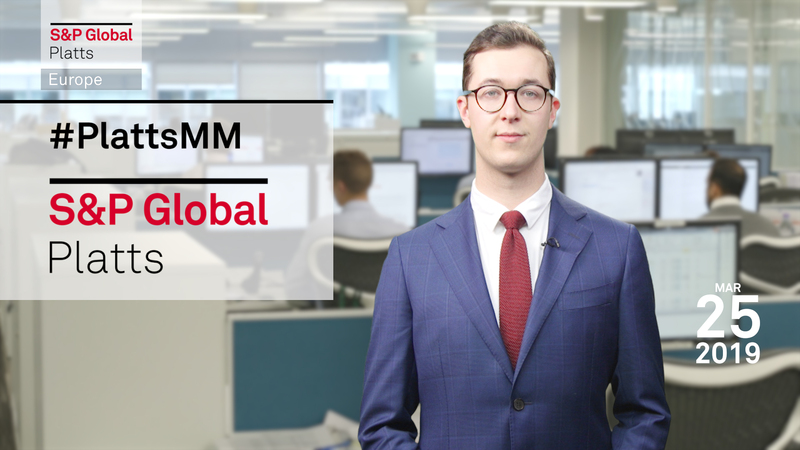 In this week's Market Movers, presented by Arthur Richier, senior pricing specialist, EMEA shipping: Markets watch for headlines from commodities conferences; Brexit implications for power markets and UK sugar imports; regional spreads suggest more LNG will head to Europe in the coming months. In this week's highlights: There's a slew of conferences going on; and yet again Brexit will be on the news agenda. But first: markets will be keeping a close eye on headlines out of the FT Commodities Global Summit in Lausanne, Switzerland starting Monday. The heads of the world's biggest trading companies, representatives of national oil companies such as Nigeria's NNPC and Russia's Rosneft, and officials from other top resource companies will all be in attendance. For metals, responsible sourcing of minerals and metals, including for the rapidly growing electric vehicles sector, will be a central theme. Participants are also expected to raise the question of how powerful trading hubs like Switzerland can encourage openness and good governance in an industry. Sustainability in mining will be another key theme explored by speakers from Anglo American, Rio Tinto and Antofagasta, in the light of the recent tailings dams accidents in Brazil which are already dictating policy. As far as conferences go, the oil sector will be spoiled for choice. Prospects for Africa's oil industry are in focus at the African Refiners Association's ARA Week conference in Cape Town. The oil ministers of Ivory Coast and South Sudan are to give headline addresses on their countries' plans, and officials from the banking and trading sectors will discuss regional trends. And new IMO rules on bunker fuel are the focus at the Fujairah Bunkering and Fuel Oil Forum in the UAE, starting Monday. Representatives from around the Persian Gulf region, the industry globally, and the IMO itself will be discussing the impending 2020 regulations. In petrochemicals, the market will be focusing on the contract prices for most olefins and aromatics settling this week. Increases have been anticipated on most markets due to higher crude oil and feedstock prices. Naphtha prices for March were 30 dollars a metric ton higher than in February. However, the market will be questioning whether these increases can be passed on to downstream polymer markets, in which demand has been lackluster due to uncertainty surrounding Brexit and economic growth. Talking of Brexit there is set to be yet another vote on the UK government's EU withdrawal deal next week after the EU gave the UK until April 1 to set out its next moves or leave without a deal. A so-called hard Brexit is seen as a risk by some but an opportunity by others. For power it would mean implicit auctions on interconnectors to the continent reverting to more formal, explicit arrangements. Implicit auctions are ones which happen automatically while explicit ones need to be set up, involving extra costs and time lags. There would also be a short-term risk to the Northern Ireland market, which is fully integrated with the Republic of Ireland. However, for some sugar exporting countries, a duty-free quota of 260,000 metric tons of raw sugar a year if there is no deal would mean they could fill some of the gap in UK supply currently met by white sugar from other EU countries. The UK will also allow unlimited duty-free imports from least developed countries. This would put EU white sugar at a disadvantage, because it would be subject to a 150 euros a metric ton tariff. However, in the UK the effect of the Brexit process is pushing the pound down against the dollar and euro, raising pound-denominated commodity prices. UK Consumer Price Index inflation has been around 2% per month since the 2016 referendum on leaving the EU, with rising gasoline, diesel and gas prices driving upward contributions. And finally Europe could be set for more LNG imports in the coming months as the key European gas benchmark TTF moved to a premium to the Asian spot LNG JKM price. The JKM price has been in freefall in recent months, driven by lower Asian demand due to a mild winter and healthy stocks. European gas prices have also been on a bear run due to high LNG imports, ample stocks and milder weather. Despite this, for May delivery the TTF is now trading almost 30 cents per million British thermal units higher than the JKM. Thank you for kicking off your Monday with us and have a great week ahead!